I made my own Berbere Spice mix in a previous post. This spice blend is quite hot but the background flavours to the heat are very nice. 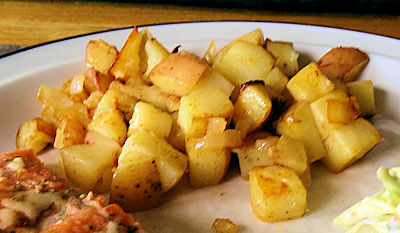 I thought the spice and complex flavours would go well with potatoes and fired up the Louisiana Grills Pellet Smoker to grill some Berbere Grilled Potatoes. I cubed two medium potatoes, chopped 125 ml (1/2 cup) of onion and sliced a garlic clove. I put those in an aluminum pie plate and tossed them with the olive oil and Berbere Spice. I covered the pan in foil and put it in the smoker that had been preheated to 350 F. You could also do this in a 350 F oven. This is one time an oven is just as good as the food is sealed in foil and won’t get any smoke. However, I was cooking a salmon on the smoker anyway. I cooked them for 45 minutes, shaking the pan a couple of times. 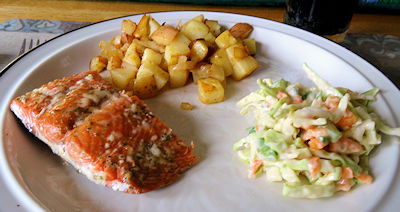 We had this with some nice salmon (next post) and some nice coleslaw. These were tasty with a nice heat and complexity from the Berbere spice. She Who Must Be Obeyed said they were too spicy but she was wrong. Just don’t tell her I said she was. 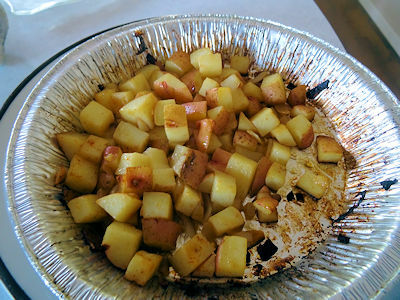 Put potatoes, onion and garlic in an aluminum pie plate. Pour oil and spice over them and stir to coat. Cover the pan with foil and put in a smoker or oven preheated to 350 F.